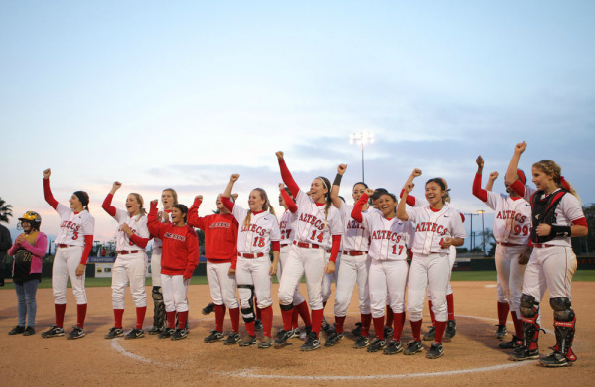 The San Diego State softball team defeated UNLV 7-0 on Friday, clinching the Mountain West title and bringing the school’s 2012-13 total to 10 conference championships. Many were impressed by the statistics in the #SDSUisWinning article, which stated that the Aztecs had won nine conference championships in current academic year. It also stated that there was potential for more. SDSU proved that on Friday, shutting out the Rebels and winning its second straight MW championship. Freshmen phenom Danielle O’Toole pitched six scoreless innings and junior Lorena Bauer went 2-for-3 with four RBIs to lead the Aztecs. With the victory, San Diego State earned the league’s automatic bid for the NCAA tournament, which begins on May 16. Be sure to tune in to the NCAA Division 1 Softball Championship Selection Show on May 12 to find out what seed the Aztecs receive and who they will face.